Time to come out of hibernation! Road Trip Memories isn’t dead, we’ve just been hibernating! It’s been such a harsh winter, we haven’t really had an opportunity to take any road trips or camping trips (we do like to camp and hike in the winter too)! We hope to get out and about this year. We’ve selected got our annual vacation destination – we’re heading west to South Dakota, which I’ve wanted to visit for a long time. After Dances with Wolves came out, I really wanted to visit the Badlands, and had a trip planned and booked. Unfortunately, the Great Flood of 1993 put the kibosh on that trip. So this year, it’s time to finally head west! We’re planning on including some Lincoln Highway into the trip as well. I’d also like to add a few movie filming locations to the site. I’ve been researching locations for a good number of my favorite movies over the past few years. This year, I’d like to add “My Cousin Vinny”, so stay tuned for that. Since a lot of that movie was filmed in Georgia, we’ll be close to Juliette, which served as the Whistle Stop Cafe in Fried Green Tomatoes, which I’ve done a blog post on, here. But it’s always great to stop by there because they have excellent fried green tomatoes, naturally! As time and finances permit, hopefully we’ll mix in more road and camping trips! We haven’t been on a road trip or camped in a while and with our 10th wedding anniversary coming up, decided to take a trip over Labor Day weekend. Only two snafus: we needed to watch our 18-month old grandson until noon Saturday while my daughter was in college classes; and then the remnants of Hurricane Isaac were heading to the Midwest. While tossing out ideas, I wanted to originally camp in northern Indiana and visit the Marshmallow Festival in Ligonier, Indiana and the Blueberry Festival in Plymouth, Indiana. I’d just enjoyed 7 wonderful visits to the Indiana State Fair a couple of weeks ago and was having major State Fair withdrawal symptoms. But being a holiday weekend meant a 3 day minimum stay at state park campgrounds, and since we weren’t leaving until noon Saturday, we decided to just stay in a motel. Adding in the uncertainty of Isaac’s path threatening to put a damper on Indiana and our plans, I was looking for someplace with a drier forecast to go. After checking the forecast for several areas and discussing several trips of various lengths, we decided that Michigan would be a good destination. The first of our two road trip options was to loop the lower peninsula, or the “mitten.” Based on the weather forecast, we would do the loop counterclockwise. The second option was to loop Lake Michigan (the Lake Michigan Circle Tour) – also counterclockwise, due to the weather forecast. We would decide on our route Saturday morning once we saw the weather forecast. Saturday morning, we decided to do the Lake Michigan loop. We couldn’t leave Indiana until around noon, and the rain in central Indiana held off until then. We immediately drove into Isaac’s rainfall north of Indy on US 31 and the radar showed rain all the way to northern Indiana, but clear toward the Michigan border. Back to the idea about attending a festival, there was a food vendor that I’d tried at the Indiana State Fair and I totally fell in LOVE with their food!! They’re called Pickle Barrel Sirloin Tips, and they’re sooooo good! Juicy seasoned sirloin tips, red skinned potatoes, sauteed onions and peppers…YUM!! I saw on their Facebook page that they would be at the Blueberry Festival, so despite the rain, we stopped by the festival and walked around in search of sirloin! The festival was very large, but we eventually found Pickle Barrel. It was a bit of a challenge to eat my sirloin tips and hold my umbrella but I managed. Our shoes didn’t fare too well in the rain, and eventually became saturated! Despite the extensive and varied food vendors, Pat didn’t find anything that looked appealing to his mildly queasy stomach, so we left the Blueberry Festival…very well impressed and certainly placing the it on our to do list again! We continued our northwesterly trek toward Lake Michigan on state roads and starting our coastal loop in New Buffalo, Michigan on US 12. In this area, the LMCT follows various roads, often called the Red Arrow Highway, Blue Star Highway or Lake Shore / Lakeshore Drive. 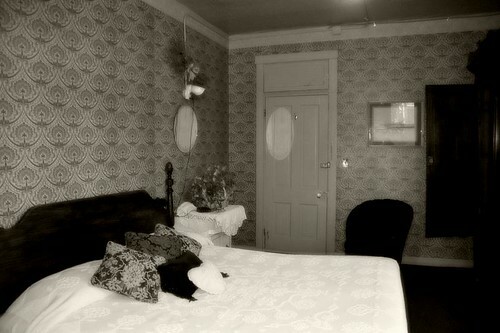 We continued until Saugatuck, and realized we were not going to obtain lodging within our budget along the coast. One mom & pop motel at which we inquired rates was a whopping $159! That was far in excess of our budget, especially for a pretty basic mom & pop. I remembered that I had a $25 Hotwire credit, and we had to search in Grand Rapids to get a very nice deal at Crown Plaza. The hotel was nice, definitely a good deal for the price, albeit off of our route. Oh well, our finance budget prevailed over our time budget! Another very early morning greeted me. I didn’t take advantage of the fitness center though; instead, I got up and got ready so we could get an early start to make up for heading off route. But sleepless nights mean groggy days and coffee is always a necessity. Must…have…coffee! A quick Google maps search on my iPhone revealed the complete absence of my beloved Dunkin’ Donuts in Grand Rapids! The horror! A search for the generic term “coffee,” however, yielded a different chain called Biggby Coffee. A quick perusal of their website sold me, and I could tell Biggby would be just fine! I love trying new places! There was one not too far from the hotel, so I refueled myself there with a large brewed coffee, with extra half and half. Very good…thumbs up for Biggby Coffee! Piping hot java in hand, we pressed on, heading northwest on the evil-I to rejoin the Lake Michigan Circle Tour route, which we’d pick up on US 31 near Muskegon Heights. North of Muskegon, we made our way over to the coastal route. We followed along the lakefront as closely as possible, but sometimes the routing took us back inland. 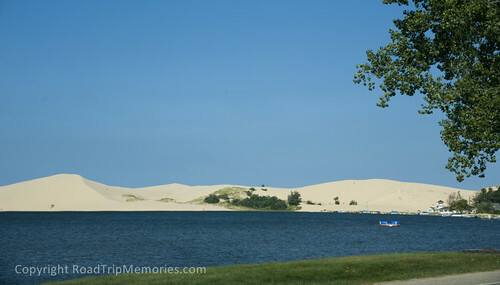 When we arrived in Mears, we were impressed by both the sight of the massive Silver Lake Sand Dunes, as well as the town of Mears. It was definitely a touristy area – with campgrounds and motels, shops, and restaurants. We decided that we would put this area on our camping to do list! The next town to the north, Pentwater, was also a tourist spot and well worth visiting too. We kept on north until we arrived in Ludington, where we stopped for lunch at House of Flavors on the advice of our friend Becky, of AMERICAN ROAD magazine. They served breakfast all day and the mood struck me, so I opted for two eggs over hard, with bacon and hash browns (just $4.99!). Pat went with House of Flavors’ take on a Monte Cristo, with grilled ham, fresh roasted turkey with cheddar & monterey jack on grilled egg-battered bakery bread. To give it the requisite sweetness of a Monte Cristo, they served the sandwich with some of their . We were planning on having ice cream in Mackinaw City at a favorite place of ours, but with a name like House of Flavors and a great selection, we decided to share a single scoop of Mackinac Island Fudge ice cream, which was vanilla ice cream swirled with fudge and soft fudge pieces. Very good and just enough to satisfy but not too much. We arrived in Mackinaw City hungry for Cornish pasties, fudge and ice cream at Kilwin’s. We’d been there before and it was awesome! I was feeling pretty hungry, so our first stop was our favorite place for pasties, the Mackinaw Pastie and Cookie Co. at their location on West Jamet. I opted for my favorite, the beef pastie, and Pat went a little different and selected the Pastie Italiano, which was a beef pastie like mine, but topped with marinara and mozzarella. Pat also had a white chocolate macadamia nut cookie, since their other specialty is, as their name indicates, cookies. After dinner, we took a walk around downtown Mackinaw City. 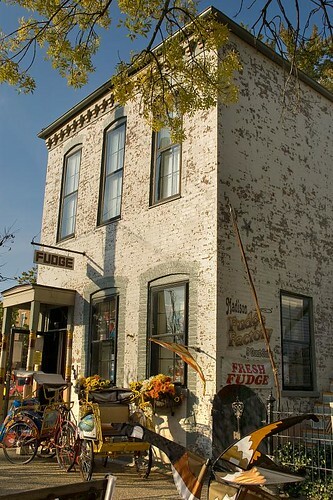 We couldn’t go through Mackinaw City without getting some fudge! Of course, we also wanted ice cream, so we went straight for Kilwin’s. As soon as I walked in, I spotted some fudge that looked really good – it was chocolate with caramels and sea salt. I don’t know who came up with this combination, but generally anything I have had with that combination has been VERY good (candy, brownies, cupcakes, etc.). I knew I was going to get some fudge, then ice cream. As I waited, I wanted to snap a quick photo of the fudge to post to friends while the clerk was helping the woman in front of me. Well before I knew what happened, clerk reached over the counter, swatted my phone and loudly and sternly admonished me – “Sorry NO taking photos!! Company policy!” It was really awkward. I was stunned and embarrassed for a moment and looked around to see anyone else’s reaction. One lady looked bewildered and in just a few moments I realized I really didn’t like that action on his part. Even if there is such a policy against taking photos, which wouldn’t make sense to me – the clerk’s enforcement of said policy was unacceptable. Simply post a sign – and certainly don’t allow an employee to swat at a customer or speak so rudely and loudly. It was bad enough he swatted at my old iPhone 3GS – I would have really pitied him had he touched my Nikon D700. I would have raised a fuss indeed! We just walked out without buying anything. I was not going to patronize any place that treated customers that way for just taking a photo. With social media, that’s free advertising! I was going to extol the delights of their fudge (and ice cream) with my friends but instead this is the review they get from me. I posted on their Facebook page, but their response was fairly generic. They said they spoke to the employee, clarifying the photo policy, but I never said specifically when I was there or who the person was. Well, live and learn. I will not be spending any of my hard earned money at Kilwin’s again – fudge shops are abundant there – and I have not had a bad slice so far! Moving on, we stopped at a few other shops, then we got to one called the Sweet Spot. They had lots of candy and sweets as well as an extensive variety of popcorn, in both sweet and savory flavors. The staff was friendly but definitely were a hard sell on the popcorn. Definitely had a similar feel to those NYC electronics shops, which were humorously spoofed on the Saturday Night Live skit, “Sabra Price is Right” with Tom Hanks. After trying at least 10 different varieties, I was popcorned out and managed to extricate myself and get over to the fudge counter, which is what I really wanted, leaving Pat to fend for himself. They didn’t have chocolate caramel sea salt (! ), but we settled on chocolate peanut butter, Snickers, and Butterfinger. Pat meanwhile, picked up two large bags of popcorn – cookies and cream and English Toffee and I got a small bag of caramel pecan. Moving on, we stopped at one more fudge shop called Joann’s Fudge, which we remembered from a previous visit, was very good as well (again, never had a bad slice of fudge!). A quick perusal of their fudge revealed that they had chocolate caramel sea salt fudge! Despite just procuring three slices (1.5 lbs) at the Sweet Spot, I just HAD to get it, since passing up that type at Kilwin’s. I was not disappointed – it was so good! We didn’t have ice cream, but had plenty of fudge and popcorn, so as sadly brief as our visit was to Mackinaw City, we needed to keep on going. We knew we were pushing the limits of time and distance on this trip! 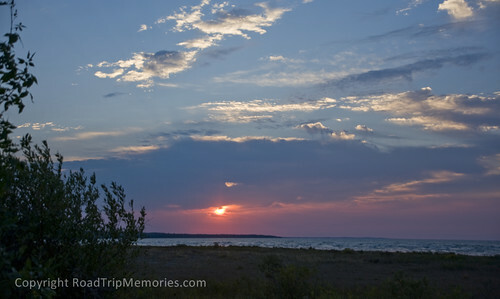 I had done some searching and found several good possibilities for lodging in the UP, in Manistique. The Star Motel had many excellent ratings on Trip Advisor, but I got a voice mail when I called. 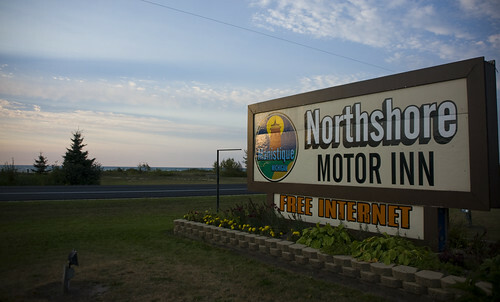 I tried the next place that was a mom & pop, and had good ratings too – the Northshore Motor Inn. They quoted me a rate of $72 for a king – I thought that sounded good and booked it. Pat was gearing up to cross the Mackinac Bridge, always a white knuckle ride for him anyway; but it was made worse for him by the ominous loop of the wind advisory conditions on the bridge and relentless thoughts of the woman whose 1987 Yugo was blown off of the bridge, free-falling 170 feet into the Straits of Mackinac. I wasn’t worried, as the woman had actually stopped her car on the steel decking side of the bridge. We wouldn’t stop of course, and we could drive on the non-steel deck. Besides, my Corolla had an additional 800 lbs over the Yugo, that had to help. The warnings also were for RVs, or vehicles that were towing boats or trailers. While that advisory didn’t apply to us this trip, we do have a Serro Scotty travel trailer and it would be nice to camp in the UP sometime, and it was pretty obvious the advisories pretty well determined we won’t be crossing the Mackinaw Bridge with the Scotty in tow! I guess if we want to visit the Mackinaw / St. Ignace area, we’ll have to stay south of the Bridge. If we want to camp in the UP, we could visit the western part and go through Illinois and Wisconsin. Chicago traffic vs. the Mighty Mac – what a choice! 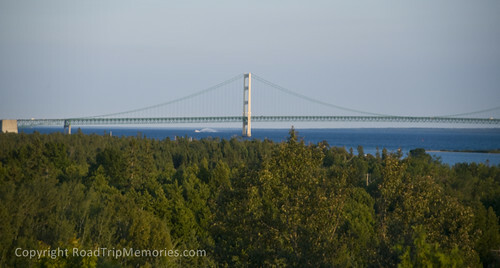 We crossed the Mackinac Bridge just fine and pulled off at a scenic rest area on the other side. Moving west through the UP on US 2, we spent the night at the Northshore Motel in Manistique, Michigan. We left the windows open so we could listen to the waters of Lake Michigan lap against the shore. We woke up the next morning and took a few photos. We continued looping Lake Michigan on US 2 and other two lanes, making an obligatory stop at Mars Cheese Castle (which was housed in a completely new building, but still retained the classic sign). Once we reached the northern Chicago suburbs, we decided to hop on the Evil-I and get home. Here is a slideshow of all of my photos from this trip. If you click on the slideshow, it will take you over to my Flickr page where you can also view the photos there. This morning at the motel, I did searched geocaching.com for geocaches along Route 66, as well as back to Indianapolis. I just got a new GPS, a DeLorme PN-40, and was anxious to try it out. I hadn’t cached for a while, and was ready for some caching! We left the motel and followed 66 through Rolla, where we found our first cache of the day, and our first in Missouri. We decided to stick with just one or two caches per hour so we could make it as far as Oklahoma City on this trip. We also wanted to get to Pop’s – a gas statiohn/ soda ranch / cafe that sells nearly every type of soda made. I recently saw a brand of soda, Olde Brooklyn, with flavors named after New York City boroughs / neighborhoods, like Bay Ridge Birch, Flatbush orange, Coney Island Cream Soda, etc. Pop’s sells it, so I know I’ll be picking up a lot of soda here! I also haven’t had Route 66 Root Beer in a while and it’s very good! We slowly meandered our way on 66 through Missouri. 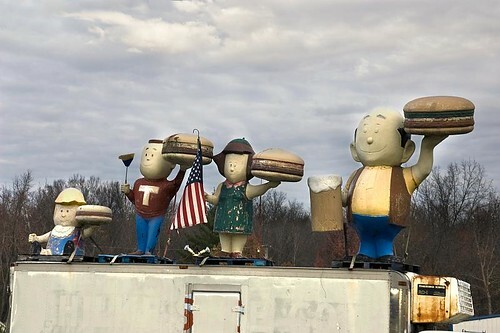 For as many times as we have been through Missouri, I hadn’t stopped to take a photo of this A & W Root Beer Burger Family…not this time! I also hadn’t stopped by the remains of the old Stony Dell Resort before, or at least, taken photos. Also picked up a cache here too! We found several more caches along the way near Devil’s Elbow as well as one when we made our usual stop at Wrink’s Market in Lebanon for a drink and a snack (homemade cookies! mmmm). We talked a little with Terry Wrinkle, son of original owner, Glenn Wrinkle. As is becoming our trend, we also stopped at Redmon’s Candy factory in Phillipsburg. 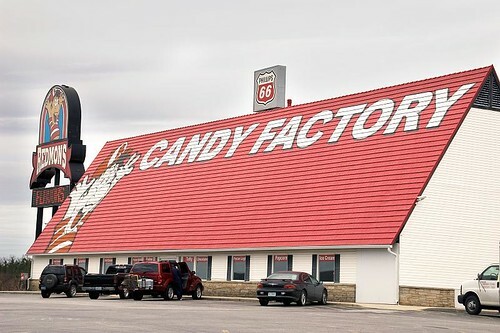 They sell homemade fudge, chocolates, taffy and a variety of hard candy that you can mix & match. They also have all types of new and old novelty candy like pop rocks, wax bottles, candy cigarettes, etc. We took 66 through Springfield and found a cache on the east end of town near the old Holiday Drive-in. Another place we hadn’t stopped to take a photo before! We continued on 66 through Carthage, Carterville, Webb City, and Joplin. In Carthage, we noticed the HISTORIC 66 sign installed by Rod Harsh, who ran a Route 66 Visitor’s Center in an old filling station in Carterville, Missouri. Rod had a “sign the route” project, and we donated $25, which made this sign installation possible. Outside of Joplin we took an old alignment of 66 into Galena, Kansas. We thought about stopping to eat a newer place in Galena called “4 Women on the Route” but it was closed (probably due to the holidays). It’s a neat new addition to Route 66. They have a cafe & gift shop and two interesting photo ops-one is a rusty old tow truck. Why on earth you ask would a rusty old tow truck be a photo op? Well, old cars, whether rusty or restored, are always cool subjects. But this particular tow truck was the inspiration for the Pixar animators to create Tow Mater for Cars. A set of eyes added to the windshield and there you have him! Unfortunately, despite the fact that these ladies possess the actual inspiration for Mater, complex legalities prevent Disney’s legal team from allowing them to refer to the truck as Tow Mater, so they named him Tow Tater instead. I suspect that many children unknowing or caring of such legalities & whose minds soak up every detail regularly make the necessary correction. We arrived at Eisler Bros. a short time before closing. We picked up a couple of Route 66 books – the 2nd volume of David Wickline’s “Images of 66″ and the 2nd edition of Jerry McClanahans amazing, “EZ66 Guide.” Don’t travel 66 without McJerry’s book. It’s an absolute must-have for any trip on 66. 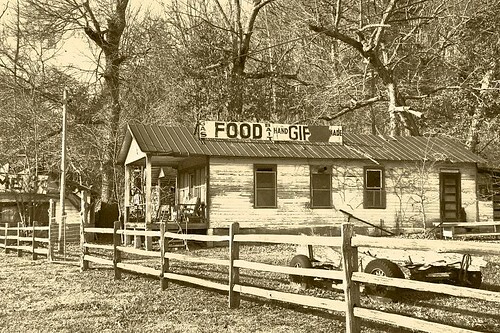 Here’s an endorsement…since we were originally heading to Atlanta, once we decided to take 66, I lamented about not having McJerry’s guide with us. As soon as I saw the updated 2nd edition, I immediately said we MUST get it! The EZ66 guide aids travelers in navigating Route 66. Excellent maps, very accurate and detailed without being TOO detailed and cumbersome, are provided along with EZ turn by turn directions. This guide is so well done, I dare say it’s darn near perfect. He gives the novice 66 travelers an EZ way of traveling the route seeing sights along the way, without bogging you down in details but yet remaining accurate with the explicit caveat that the route does change over time, traffic conditions, detours, etc.). 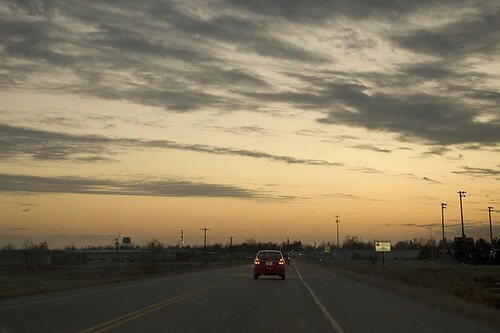 With late fall trips come early sunsets and sunset fell quickly as entered Commerce, Oklahoma. 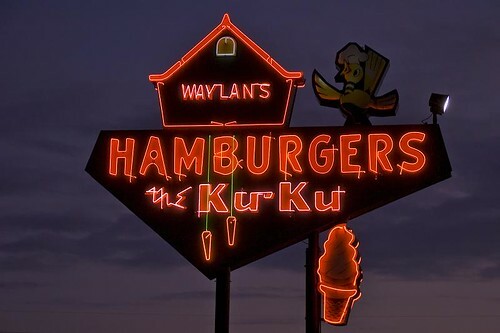 Pat and I both had the same thought about dinner: Waylan’s Ku-Ku Burger! Great hamburgers and crushed ice…and a great neon sign at dusk! It was a little (only just a little) past the ideal time I like to shoot neon, but still enough ambient light to get a good shot. 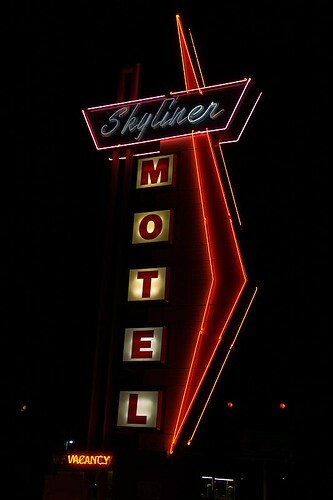 We ended up in Stroud, and thought we’d check out the Skyliner Motel. After looking at a room, we decided to stay. For more details about a particular photo, click on it in the slideshow and it will open in my Flickr site. We woke up this morning intending to head south to Georgia. After a last check of the weather we noticed the forecast had worsened. The chance for rain increased significantly, and since I had a specific purpose for this trip mostly involving outdoor photography, it was not something I wanted to do in the rain. We struggled between wanting to go and whether or not to trust the forecast. We could go somewhere else with a better forecast or not go at all. Pat hinted at going west on 66 since we hadn’t done that in a while. He’s very indecisive, as readers of his blog know from his recent post. We didn’t have enough time for him to put up a poll on his blog to decide where to go, so he let Amber decide. He wrote 3 options on bottle caps: go to Georgia as planned, take Route 66 west as far as we could go, or stay home, and geocache locally. Whichever cap she picked was what we’d do, and she picked geocaching. Since we now had no time constraints, I watched the Macy’s Thanksgiving Day Parade with Amber & plotted a couple of Indiana cache routes with my new DeLorme Topo 7 software. I also played with transferring waypoints to my new GPS, a DeLorme PN-40. So once I did that and the parade ended, I asked Pat about heading out. Then Pat says, “Wanna go to Atlanta?” So much for the written in stone bottle cap selection. I’m game to try it, so I finished packing, said goodbye to Amber and off we went. We figured by this late hour, we’d have to superslab most of the trip, so we could get to our destination at a reasonable hour the next day. 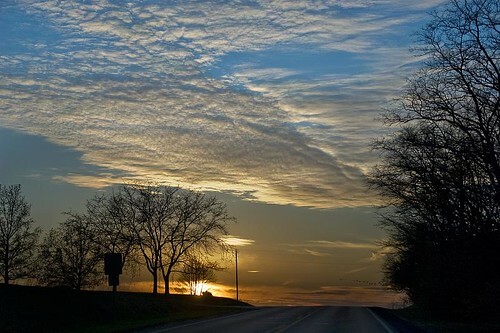 It was especially important, since the forecast called for some showers building late Friday and Saturday was looking like a total washout. As we headed south on I-65, I started feeling some negative road karma, but while I didn’t want to go home, I really didn’t want to deal with rain. I also didn’t feel like having to superslab the trip in a hurry, and I thought that by the time we’d get to Atlanta, I’d only have a small window of “cloudy” weather with rain closing in. At best, I’d have to rush around taking my photographs before rain set in, and at worst it would be raining. So I said to Pat, “Let’s go on 66 instead!” So we cut across town to I-70 and started our journey west. After we crossed into Illinois, we took US 40, only taking the evil-I into St. Louis. We exited at Hampton Road and took 66 partly through town. By now, Ted Drewes is in “Christmas tree selling” mode. 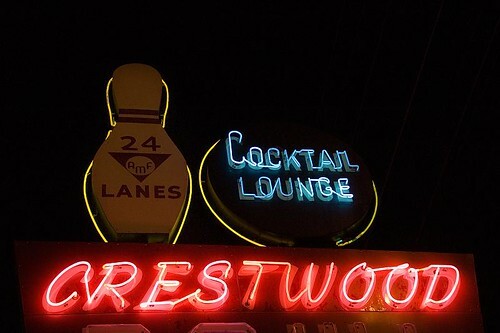 We passed by Crestwood Bowl, of which I haven’t had the chance to take a photo until now. On Chippewa, there was a Shell station with unleaded gas for 1.33! We took the Interstate from the west side of town to Eureka, then took 66 until Stanton. At that point, we got back onto the Interstate. We thought we might make it as far as Rolla where there are plenty of lodging choices. We passed by Finns Motel in St. James and decided to check it out. The price was reasonable the room was clean and they had WiFi so we opted to stay. We didn’t get much sleep the night before and I was fairly exhausted so I fell asleep right away. Frank Sinatra, Dean Martin, and Shirley MacLaine didn’t go running to Madison, Indiana for fudge, but every once in a while, we do. Madison, Indiana is a neat town in southern Indiana with very nice architecture, shops, and dining. 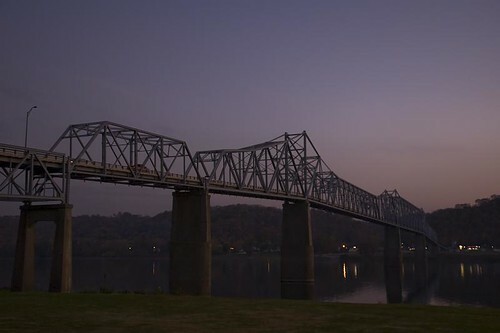 It sits right on the Ohio River and was the filming location for the 1958 film “Some Came Running,” starrring the aforementioned celebrities. It was a nice day, we felt like getting out, so we drove down to Madison to pick up some fudge at the Madison Fudge Factory & Guest Suites. They have two guest suites upstairs, and the evening turn-down service includes fudge samples. Don’t quote me, but I think a night’s stay includes a half or full pound of fudge, as well. The shop also sells jellies, jams, salsas, and they have a separate area, which serves as a toy shop. 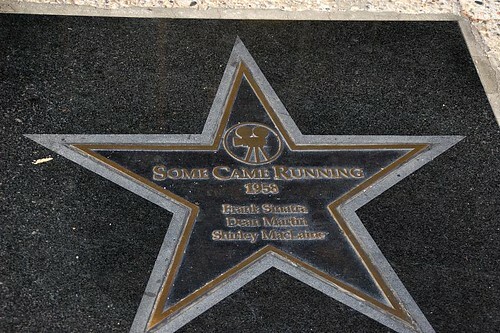 They also had a star embedded in the sidewalk (reminiscent of the “Hollywood Walk of Fame”) paying permanent tribute to the film and its stars. 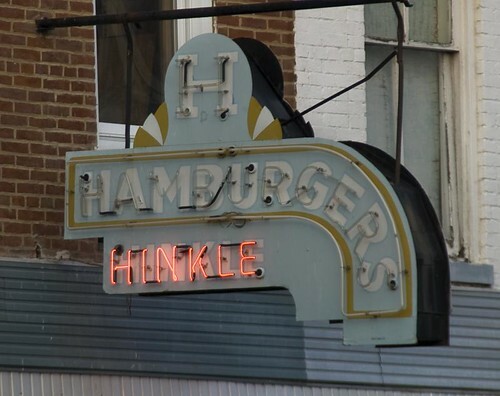 We had dinner at Hinkle Hamburgers, and since I was craving a hamburger, I ordered one. To my surprise, they were small, similar to White Castle’s hamburgers. I was starving, so I ordered another! They were very good! 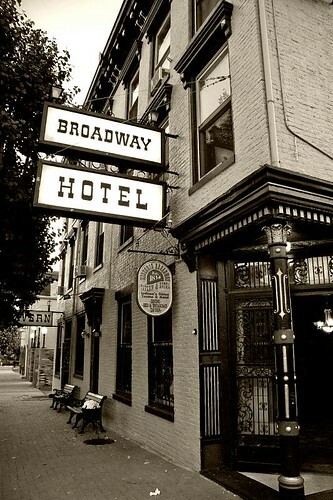 As sunset approached, we walked back to the car and saw the Broadway Hotel. This place looks like an interesting place to stay. It looks very close to its original 1800’s style. The rooms don’t have many modern amenities like phone, television, or internet service, but they do have the modern essentials of air conditioning and indoor plumbing! They let us see a room, and we walked up the narrow, creaky staircase. Amazingly, the doors have actual keys! We drove over to the Milton-Madison Bridge, which carries traffic on US 421. We drove back home and passed by the Moon-Lite Motel in Versailles (which, in Indiana, is pronounced veer-SALES, not to be confused with vehr-SIGH in France). 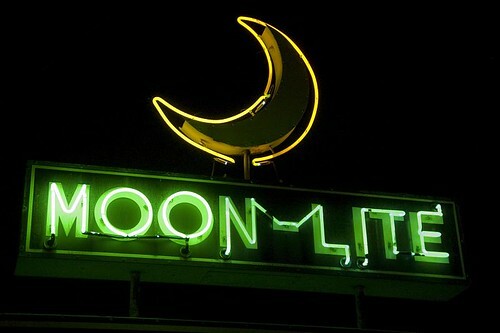 We saw this motel several years ago and thought it was really cute, with a terrific neon sign too. It was dark, so the neon sign was aglow. I prefer photographing neon at dusk, when there is still ambient light and the sky is a perfect indigo, but you have to take what you can get! This time, we were strictly passing through on the way home (and of course, Article 7.4.2 of Murphy’s Law dictated that this time, the sign read “VACANCY”). We stopped in to speak with the owner, and she gave us a short tour and history of the property. We continued home and always looking ahead for cool neon (or other retro) signs, I saw some neon glowing down the road. 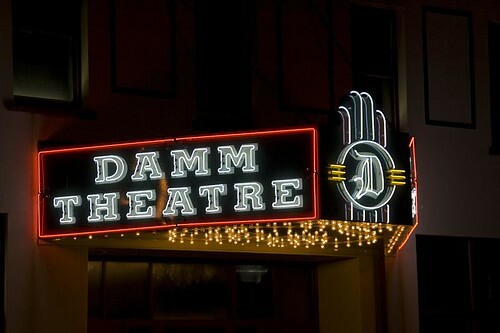 Signaling Pat to slow, down, we saw the Damm Theatre, in Osgood, Indiana. The alternating blinking lights on the bottom were not on, but the neon was. I stepped out of the car with my camera in hand, and as I adjusted my settings, the blinking lights came on, as if on cue! Part 2 of “The Great Outdoors” as we return to the Sleeping Fawn Resort in Park Rapids. While we needed to take the Interstate up, for the most part, we returned along the Great River Road through Minnesota. We crossed into Wisconsin, back over to Iowa, and back to Wisconsin, before taking Wisconsin State Road 11. We then needed to take the Evil-I home to Indiana. Pat has mentioned many times over the past several years about wanting to visit Minnesota. As a child, it was his family’s vacation destination of choice, and he also visited several times as an adult, the last being 1995. Other than our journey to the Twine Ball in November 2005, I had not been to Minnesota. So, we thought a trip to “The Great Outdoors” would be a fine idea. One of my favorite movies is “The Great Outdoors” starring Dan Aykroyd and the late, great comedian, John Candy. The film epitomizes the family northwoods vacation and our experience reflected that – everything reminded me of something from the movie. We didn’t have a 96-ounce steak, rent a jet boat or encounter a bald-headed bear, but we had fun and enjoyed the beautiful country anyway. We stayed at a resort called Sleeping Fawn, located about 12 miles northeast of Park Rapids. Weird Al inspired this road trip. Really! After hearing the Weird Al song, “The Biggest Ball of Twine in Minnesota” we decided to make our own journey to the Twine Ball. After workin’ all year down at Big Roy’s Heating and Plumbing. They picked the biggest ball of twine in Minnesota. Pulled out of the driveway, and the neighbors, they all waved goodbye. And so began our three-day journey. He smelled real bad, and he said his name was Bernie. I put in a Slim Whitman tape, my wife put on a brand new hair net. As we rolled down the long and winding Interstate in our ’53 DeSoto. We’re gonna see the biggest ball of twine in Minnesota. We’re headin’ for the biggest ball of twine in Minnesota. Oh, we couldn’t wait to get there, so we drove straight through for three whole days and nights. Of course, we stopped for more pickled wieners now and then. The scenery was just so pretty, boy, I wish the kids could’ve seen it. with the decals from all the places where we’ve already been. And the Mecca of Albino Squirrels. And a place where you can drive through the middle of a tree. But there’s still one thing we’ve gotta see. On our way to see the biggest ball of twine in Minnesota. Out in the distance, on the horizon it appeared to me like a vision before my unbelieving eyes. We parked the car and walked with awe-filled reverence toward that glorious, huge, majestic sphere. I was just so overwhelmed by its sheer immensity, I had to pop myself a beer. 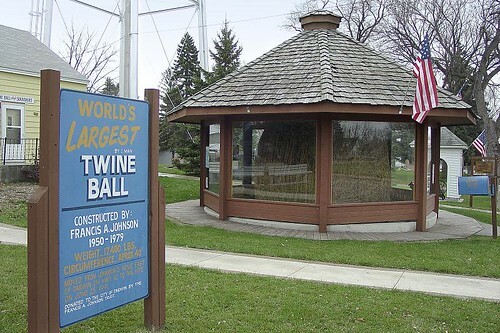 There sits the biggest ball of twine in Minnesota. I tell you, it’s the biggest ball of twine in Minnesota. Ohhh, what on Earth would make a man decide to do that kind of thing. Ohhh, windin’ up twenty-one thousand, one hundred forty pounds of string. What was he tryin’ to prove? Who was he tryin’ to impress? Why did he build it? How did he do it? Where did he get the twine? What was goin’ through his mind? Did it just seem like a good idea at the time? But I was only teasin’. Some window decals, and anything else they’d sell us. Won’t the folks back home be jealous. But at least we’ve got our memories. And I fell on my knees and I cried and cried. And that’s when those security guards threw us out. ‘Cause it’s the biggest ball of twine in Minnesota. I’m talkin’ ’bout the biggest ball of twine in Minnesota. Well, we stayed that night at the Twine Ball Inn. In the morning we were on our way home again. But we really didn’t wanna leave, that was perfectly clear. Than the biggest ball of twine in Minnesota. I said the biggest ball of twine in Minnesota. When we awoke Sunday, our Wayfarer Inn experience wasn’t over. When we discovered there wasn’t any hot (or even lukewarm!) water coming out of the shower, Jennifer decided she’d had enough and called the front desk. When she told Mr. Patel we weren’t getting any hot water, he said it would get hot if we left it on “for 5 or 10 minute”. At this point, Jennifer vowed to never take a chance on an independent motel she hadn’t previously stayed in. So, feeling a bit peeved at Mr. Patel’s remedy for hot water, we just decided to end this nightmare and leave. (I won’t tell you that we left on all the lights and television.) We then went next door to Shoney’s for breakfast (best breakfast bar around!). After breakfast, we stayed on 66 through Rolla and made our way back east. We noticed the Mule Trading Post was open, so we had to stop. Noticing we were wearing Route 66 garb, the man behind the counter informed us all the Route 66 merchandise was 10% off. So we stocked up on some of Jerry’s postcards, Bob Waldmire’s “Bird’s Eye View” of Route 66, and a map poster of his as well. Leaving the Mule Trading Post, we jumped on I-44 east so we could get back early enough to take 66 through Illinois. However, I can only take “so much” of the interstate when I know 66 beckons nearby. So we got off 44 in Cuba, MO and rejoined 66. We took 66 back to Stanton, where we took the road towards Meramec Caverns and stopped at the Riverside Reptile Ranch. If you’ve never stopped here, it’s well worth the $4 admission. Jennifer & Amber stopped there last August while on their trip (Riverside Reptile Ranch, August, 2000) They have all sorts of critters there, ranging from turtles, lizards, and a variety of snakes. As Jennifer walked down the corridor where the displays are on both sides, she turned the corner at the end of the corridor to get a better look at a lizard. Much to her surprise when she turned the corner, there waiting for her was a tortoise on the floor that was at least 4 feet long and every bit of 2 feet tall! Fortunately, her heart failure was only temporary. At one point in the tour, we were nervous when our 12 year old tour guide got into the “cage” where two alligators were residing. He had a broomstick handle with him and put it around the mouth of one of the gators. We took about 3 steps back when this thing let out a loud “hiss” that sounded more like a vacuum cleaner! We were both having thoughts of this young man becoming lunch, so we were relieved when he decided to get out of the cage. We finished the tour by heading out behind the building to see Leo, the 2 year old lion they have. They’ve had Leo since he was 2 months old. He was a very playful little fellow (if you can call a 400 pound lion “playful”), as he would rub against the fence while you could pet him. We were told by Bill Fitzgerald (at left, with Jennifer & Leo) that he could reach up to 600 pounds when he reaches maturity. Leo got a little tired from showing off in front of us and laid down next to the building. Thanking Bill for the tour and the stories about Leo, we took off for St. Louis. gassed it and it blasted out of the trench. It left a nice “navigational waterway”………perhaps the motel can put a riverboat casino in it?? 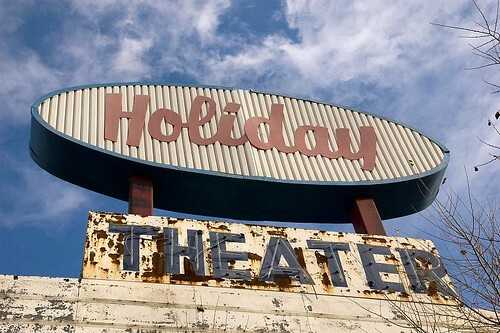 The Bel-Air Drive-In sign is still there, however the property will soon be developed into commercial businesses (hotels, restaurants). So we got a picture of the sign before it disappears for good. From Mitchell, we motored up to Edwardsville where we stopped at the old A&W Root Beer, that appears to be weeks away from the wrecking ball. Jennifer stopped there last August on her first Route 66 trip and took some pictures of it (Route 66 – Illinois, August 2000). From Edwardsville, we went through Hamel and stopped again at Staunton to get pictures of Henry’s Old Route 66 Emporium and the Country Classic Cars. We then ventured to Mt. Olive and poked our noses in the windows of Soulsby’s Service Station. In Litchfield, we got pictures of the Route 66 Cafe, the Ariston, and a few other miscellaneous signs. Next we made a stop at Francis Marten’s farm and the “Our Lady of the Highways” shrine. Just north of the farm, I eyeballed where the original alignment went due north of the farm. Less than a mile later, I spotted a drainage ditch that showed a wide section of concrete next to it. Thinking we spotted a “gold mine” of 66 history, we stopped to investigate. The section was about 6 feet down from ground level in the ditch, on the south side of the ditch and ended at the water. What I found interesting is that it was directly below where that original section would have been. But then I realized with the fields next to it, would the road have been that far below the rest of the ground around it? Doubt it. I still would like to know what it was we were looking at. Perhaps Steve Look knows where & what this is?? Back on the road, we stopped by Art’s Motel & Restaurant for more pictures, and then it was on to Springfield. We explored an old 4 lane section of 66 on the south side of Lake Springfield that now serves as access to the boat ramps for the lake. We parked there for a while & contemplated where to have supper. We decided to try the newly re-opened Tropics in Lincoln, so we got back on 66 and drove through Springfield and stopped in Broadwell at Ernie’s Pig Hip Restaurant for some more pictures. From there it was on to Lincoln where we got a couple of pictures of some older motels there before dining at The Tropics. That was the first time either of us had dined there, and it was very good. We had a generous supply of mozzarella sticks for an appetizer. Jennifer ordered the Stuffed Shells, and I had a Meatball sandwich on a hoagie. It was all reasonably priced ($21 for both) and worth another stop. 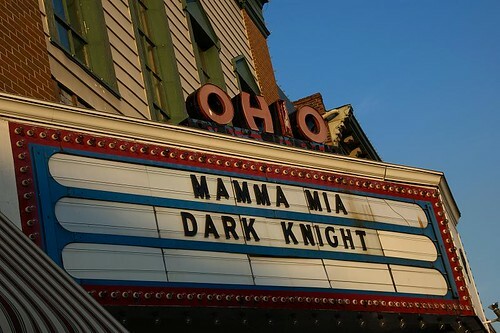 They’re open ’til 10 most nights. We left there shortly after 7pm (they hadn’t turned the neon sign on yet, darn it!) and jumped on I-55 to head back to Romeoville. We passed through some threatening black clouds, but the rain wasn’t too bad. We got back to Romeoville shortly after 9pm, thus ending our busy little 2 day jaunt on the Mother Road. Hope you all enjoyed it “with us”! For our next day, we left from Downers Grove on I-294 north up to the O’Hare Oasis for breakfast. We then continued north on I-294, exiting at US 19, which we followed into Skokie and Evanston. We stopped at a park on Lake Michigan and took a walk by the lake, and through a very nice, seemingly exclusive neighborhood of stately elite homes, many in brick. We drove down into the city to visit the Hit the Road travel store owned by Route 66 mailing list members Maureen and Annice. We talked with Maureen for a bit and had a nice visit at the store, and we both bought a number of items there. 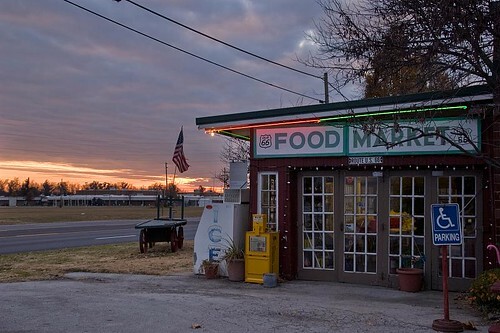 They have great road travel supplies, maps, car organizers, kids games and so on…as well as Route 66 memorabilia, books, and videos. One interesting thing they have available is custom made diner furniture, if you want a retro style diner booth and table, or round stools, they can custom order this for you, at pretty reasonable prices! We then drove downtown to Route 66, turning east onto Jackson. We passed by Lou Mitchell’s (I still have to get there for breakfast!). Rather than head over to Adams & Michigan, we turned south and made a quick loop around the block and headed west on Adams from this point. We went through the run down area in Cicero, where there was a tricky intersection (there’s a detour, so follow the signs!). We ended up on 26th Street, but of course, we weren’t lost since Pat is known as the Road Maven (and I’m pretty good with directions too)! We simply followed 26th Street west to the intersection of IL 43. We made a left turn south, until we reached the intersection of Ogden (White Castle Hamburgers on the corner). Unfortunately, on the short stretch of Ogden which we missed was a neat hot dog place called Henry’s (with a great neon sign! ), and Bunyon’s Hot Dogs. 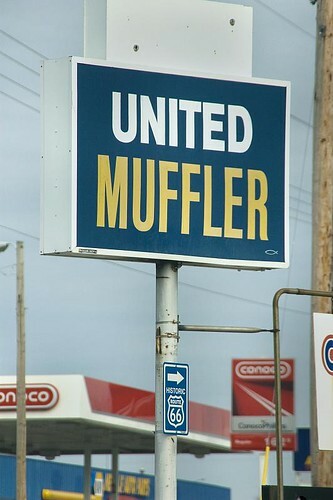 I passed by this on my first trip as well, to see my first muffler man there (though I hadn’t seen Henry’s then). We didn’t go back to see Henry’s or Bunyon’s, so we continued on 43 and then followed Joliet Road through the Forest Preserve and into Lyons. 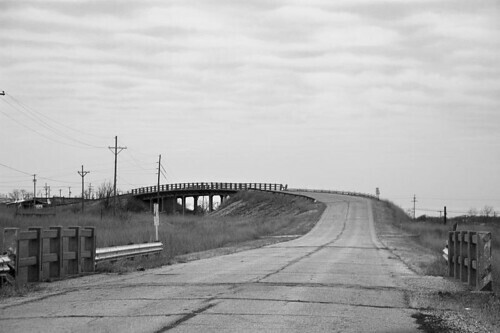 In McCook, there is a detour of Joliet Road. There are signs to guide you, but you follow 55th Street west to S East Ave. and head south until the road hooks back up to Joliet Road. Pat explained that this area is closed because Joliet Road ran along the middle of two huge quarries on either side. It was not structurally sound, so this section was closed. You can see the quarries a little bit on the detour. There’s not too much interesting to see along here, it’s an industrial area. In Countryside, we were on the lookout for the Wishing Well Motel on the right…unfortunately, we were so focused on it that we missed the Route 66 Cafe and Grill 3/10 mile before it…we couldn’t figure out how we missed it! I was especially baffled, since if you read the narrative of my first trip, I had brunch there! Well, it shows how selectively we see things, and how our memory works to remember how things are…a day or two later, I was too curious as to how I missed it, so I had to go back. It turns out I had seen the sign, but it didn’t really register in my mind…because it wasn’t the Route 66 Cafe and Grill anymore! 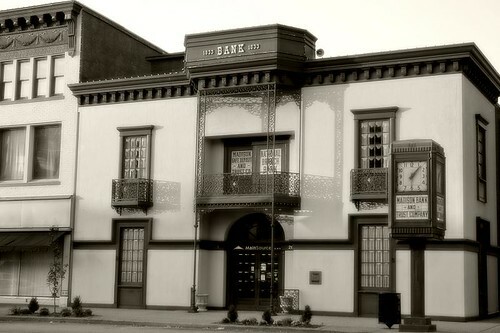 It’s now called the William Tell Restaurant, and is located in the same building, only off to the right near its attached motel. I should have realized this the day before, because the sign is still a round white sign, but I was focused on looking for the Route 66 shield, it never occurred to me. Plus, I remembered the area as being different than it really was, with a bigger parking lot – that’s why I say your memory sort of alters the way you remember things! So, the sign for the Route 66 Cafe & Grill is no longer there, very disappointing! There is a very faded neon sign still on the building, but without the word “Grill,” and there is a listing in the phone book for the Route 66 Cafe. I believe it is still open for breakfast and lunch (as the sign indicates). If you are there early, check it out. It was good at the time Amber and I went in August 2000. We continued through Indian Head Park and Burr Ridge, and ended our trip by having an early dinner at Dell Rhea’s Chicken Basket, where Pat introduced me to a Midwestern delicacy……chicken gizzards. However, I opted for grilled herbed chicken breast instead, and it was absolutely excellent! That concluded this trip…till next time! 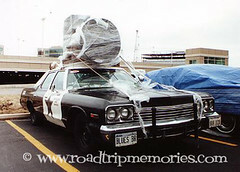 This is a picture of a “Blues Brothers Car” we spotted from the window of room at the Suburban Lodge in Downers Grove. It was still there last month, and the shrinkwrap from the speaker was removed…it’s really cool to see that!